You likely did not read much, if anything, in the mainstream press about the climate change conference that was held in Doha, Qatar. The same applies to television and radio news. These are the folks who introduced the Kyoto Protocols in 1997 with the intention to reduce greenhouse gas emissions said to be causing global warming. The U.S. Senate unanimously rejected them in an exercise of good sense we don’t always associate with that august body. The conference ended on Friday and the last money grabbing gambit failed. It was time for the 7,000 “observers” and its delegates to go home, all knowing that even the Kyoto Protocols will end in 2014 and that COP18 was yet another monumental failure. CFACT was founded in 1985 by Rucker and David Rothbard, both of whom believe strongly in the power of the market, combined with the applications of safe technologies, to offer practical solutions to many of the world’s pressing concerns. They were soon joined by leading scientists, academics, and policy leaders, along with thousands of citizens from around the nation. CFACT has been especially watchful of the many “global warming”, now “climate change”, claims put forth by the IPCC, attending its conferences and reporting from them, as well as challenging the absurd claims made during them. It is essential to understand that scientific literature shows no link between recent extreme weather events like Hurricane Sandy and the bogus global warming. Indeed, the planet has been in a natural cooling cycle for sixteen years. Rucker reported that those controlling the COP18 “have instituted a ‘paperless’ policy, depriving delegates of daily programs and copies of negotiating instruments that keep them relatively informed.” The justification for this is the number of trees saved from becoming paper and, as of Saturday last, it was determined to be 217! As for the delegates’ carbon footprint, this policy totally ignores the emissions from their jet travel, their five-star hotels and restaurants, air conditioning, limousines, and the carbon dioxide they are all exhaling. There have been periods in the Earth’s history when there were far higher concentrations of carbon dioxide (CO2) and the result was an abundance of vegetation. Lots of dinosaurs ate it and other dinosaurs ate them. There was an increase in CO2 during our present period on Earth that began when the last ice age ended about 11,500 years ago. The rise of agriculture allowed our ancestors to feed more and more humans and livestock, giving rise to the spread of civilization and it too contributed to an increase in CO2. Presumably, these are good things because increase of CO2 suggests that the next ice age has been delayed to some extent. As of this writing, it is unknown what the official U.S. response will be to the effort to get developed nations to ship bundles of cash to any undeveloped nation experiencing a hurricane, a typhoon, a blizzard, or any other “climate event.” In a cash-strapped nation about to “go over the fiscal cliff” did President Obama instruct U.S. delegates to go along with this absurd demand? Probably. It is useful to know that Canada, Japan, and New Zealand have already rejected any participation in the agreements to come out of COP18. One assumes that the European Union, as financially challenged as the U.S. and struggling under soaring renewable energy costs, would be of the same mind. Add to them China, Brazil, India, Indonesia and other emerging markets that need to grow their economies and which are dependent--like every other nation--on coal, oil, and natural gas. Mandatory reductions in greenhouse gas emissions would be the kiss of death. The U.S. is about to undergo this madness in the form of a deluge of Environmental Protection Agency carbon dioxide regulations that will strangle the economy and kill jobs. Unless the Congress can eliminate them via legislation, it will constitute a form of national suicide. The United Nations isn’t just involved in climate treaties. It is seeking control over the worldwide Internet, the oceans of the world, gun control, and regulating the rights of parents to exercise control over their children’s health and well being. If successful, the U.N. will lead the world back to a new Dark Ages. Since carbon dioxide is heavier than air doesn't it eventually settle and not be part of the atmosphere? 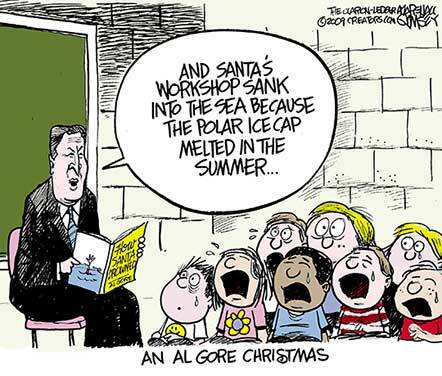 Wouldn't you love to be able to BUY Algore for what he's worth and then SELL him for what he THINKS he's worth? CO2 is aborbed by the oceans and released at some point. It represents 0.038% of the atmosphere, making it a "trace" gas. Fred: What is a bucket of piss worth these days? Not that he's worth that much. I though the EU, Australia and every third-world hell-hole were just about the only countries which signed up? Together they account for just 15% of emissions. So, just another useless money grab from the 'wealthier' countries to give to those third-world hell holes who signed up for their bit of redistribution funds. This is all about money at the end of the day - taking from the wealthy Western countries to give to those countries who couldn't be bothered to lift themselves out of poverty. Just How Awful will 2013 Be? Is Every Single Animal and Reptile Endangered? Is Pearl Harbor Ancient History?